The black and white photo is historical. The color photos are by Forrest Anderson. The entire cabin shuddered as a chain hooked to the bucket of Bill Van Dyke’s backhoe pulled taut around the cabin’s massive center ridgepole. The men perched on the swaying roof hung on and held their breath. The ridgepole, 37 1/2 feet long and more than a foot in diameter, wrenched free of the roof’s center and rose in the air, hooked in the chain. As the backhoe retreated from the cabin, the enormous log swung away with it. Turning deftly to avoid upsetting the backhoe with the beam’s immense weight, Bill carried it outside the meadow’s gate and laid it gingerly in the grass. 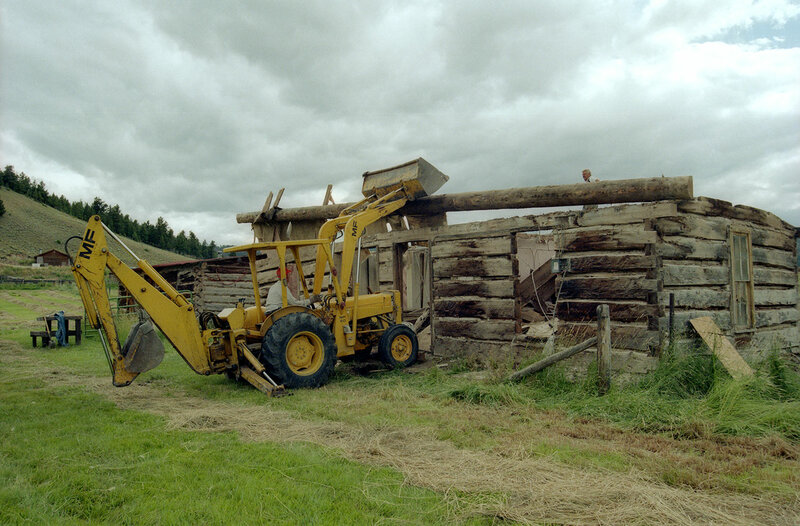 The ridgepole was the largest of several dozen logs that we salvaged from a pioneer cabin that once served as the post office for the ranch community of Powderhorn in Gunnision County, Colorado. Built by Colorado pioneer Elijah Adams McGregor in the 1880s, the cabin housed five generations of Elijah’s descendants, including me. 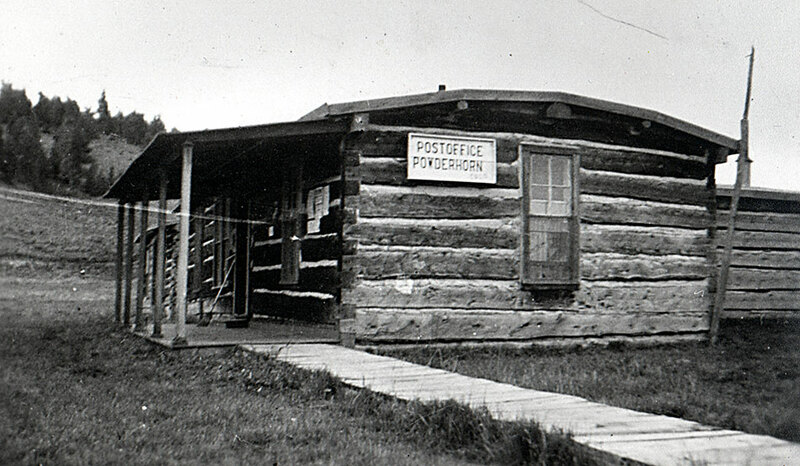 Elijah, his daughter Sadie Nichols and his granddaughter May Rouviere ran the post office in the parlor of the two-bedroom cabin for a total of 95 years. As a child, I spent nearly as much time at the cabin as at home. It was the most delightful place I have ever been. I could believe in all kinds of fantasies there – the roof was in my child’s mind the perfect place to pasture a fairy tale cow. It was easy to imagine the Gingerbread Man popping out of the oven in the kitchen and running away from my grandmother. Visiting the old-fashioned cabin was like dropping into a favorite TV Western. The kitchen was alive with lacy curtains, braided rugs and luscious smells of pies, cookies and cakes made for the haying crews. The cabin was stuffed with quaint heirlooms — a carved pump organ, iron beds, a kitchen cupboard that Elijah built, quaint knicknack shelves. 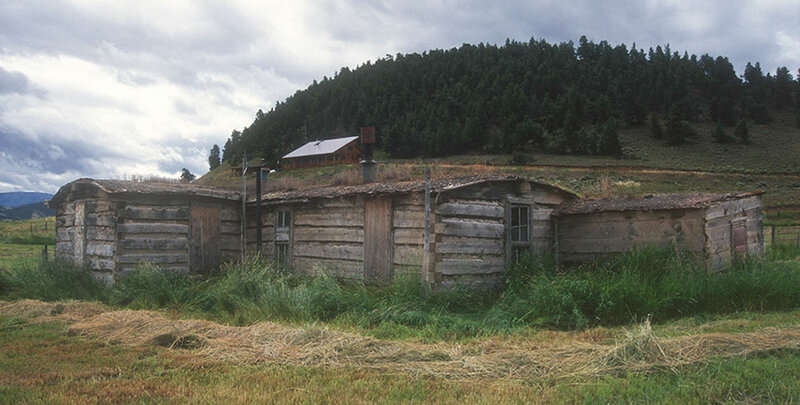 May passed the cabin on to her son Chet Rouviere, who sold the ranch to Bill in the mid-1980s. By then, the cabin was dilapidated, its roof caving in and its log foundation rotted. When Chet died in 1996, he willed most of the cabin’s former furnishings to my sister and me. My mother happened to come across a magazine article about a couple who had bought, dismantled and moved a log cabin several hundred miles, then rebuilt it. Hum. Best idea since pockets on shirts. I fired off a fired-up letter to Bill Van Dyke, introducing myself and offering to buy the cabin and remove it from the site. Bill had looked into having the cabin designated a historical site and had found that getting it in shape to qualify would be too expensive. He had no need for the dangerously tumbledown cabin. He wrote back that “heaven or hell” could not induce him to take money for it. He not only offered to give the building to me, but to help dismantle it. Our pioneer house-razing took place over four days in the summer of 1997. We learned more about my great great grandfather and his carpentry skill by peeling off layer after layer of history as we dismantled the house than we could have learned in years of genealogical research. Bill and his backhoe first took off the back porch and we then dismantled an attached milkhouse to reveal the basic T-shape of the cabin. We then scraped and shoveled black sod off the roof, as the cabin’s roof originally was covered with sod and the walls were still holding up 6-8 inches of it. We removed windows and stripped off layer after layer of wallpaper from the inside of the cabin, pulling out nails until we had shopping bags full of them. The oldest of the nails were square, with 100 years of various styles of nails mixed in among them. We discarded the window frames, but saved a stack of the wavy window glass. Each log was tightly secured to the one under it by long nails and sometimes spikes. Wood and cement chinking between the cracks in the logs had to be pried loose. Long logs had to be pried apart, chained to the backhoe and lifted off. The walls made of short logs proved to be simpler, as a strong relative could simply lean against the walls, Hercules-style, and the walls would topple over, The mortar and chinking between them would loosen so it could be gathered up. We salvaged shelving made of the lids of wooden boxes that had contained biscuits and other food products, one of them still encased in brown paper wrapping that had on it stamps and the address of a relative who had lived in the cabin before Wrold War II. After dismantling the cabin, we stored the logs. Whereupon, we got jerked clear across the country for a new job opportunity. Our restoration project was on hold for almost two decades. Fast forward to The Thoughtful House project. 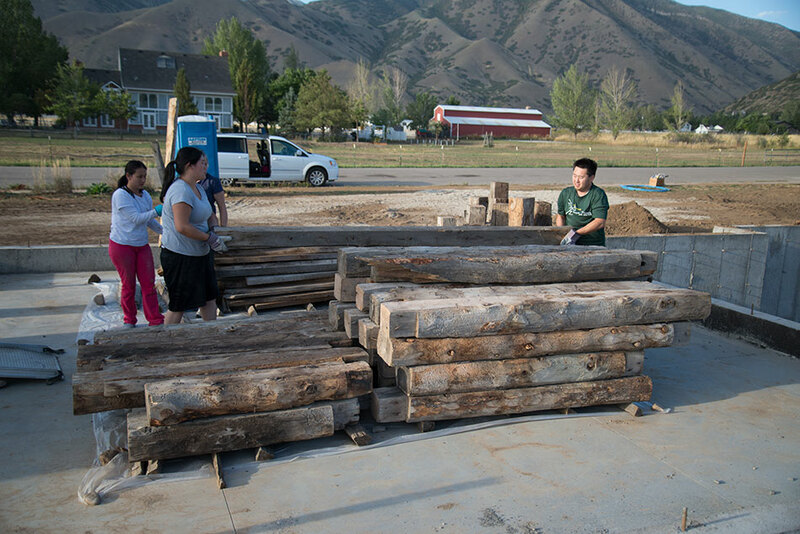 Our children, young when we dismantled the cabin but now grown, joined us this week to move the logs from their storage in Gunnison, Colorado, to Mapleton, Utah, for use in The Thoughtful House. We appropriately chose Labor Day weekend, making two runs with the logs on trucks and then moving them onto the building site. Our next step will be extracting the remaining nails out of the logs so that they can be used in The Thoughtful House. In the years since we dismantled the cabin, recycling timber has come a long way. The practice became popular in the 1990s when consumers and the lumber industry became concerned about deforestation. Recycled timber gained a reputation as a sustainable way to turn waste into usable products. It has since become an entire industry niche that in turn has spanned such a popular decor trend that many new products such as engineered flooring, furniture and picture frames are made to look like old weathered wood. Despite its benefits, recycled timber has some drawbacks, among them the need to trim off decayed parts. This often results in shorter, non-standard pieces of wood that may not meet building codes. It is normal to have 20 to 40 percent waste from recycled wood. Other problem is the need to pull out all of the nails and to cut and size the wood for new uses. Dismantling buildings in such a way as to preserve their timber can be time consuming. It can be cheaper and easier to buy new wood in standard uniform sizes. Because of these limitations, we chose to use our recycled timbers primarily for trim purposes and to dismantle the cabin, move the logs and pull the nails ourselves to save some money. We'll use new standard lumber for the basic framing of the house, both to bring The Thoughtful House within our budget and to ensure that the house is sufficiently strong structurally.